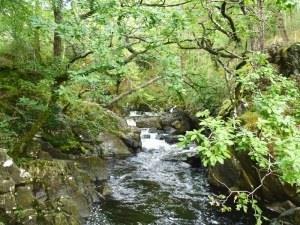 Walking Routes at Coed Ganllwyd Nature ReserveWalking RouteA network of paths on the reserve mean you can choose from circular walks of 100 metres up to more demanding routes that stretch over two kilometres. The paths on the reserve are steep and rough with gates, stiles and a few steps leading up to a footbridge. The route to the waterfall viewpoint is particularly steep. The woodland at Coed Ganllwyd is considered to be the richest site for mosses and liverworts in Western Europe. The extreme humidity within the gorge is caused by a combination of high rainfall and continuous river spray, which is prevented from evaporating by the dense oak canopy. A network of paths on the reserve mean you can choose from circular walks of 100 metres up to more demanding routes that stretch over two kilometres.